Finding and fixing broken links on your site is one of the easiest ways to immediately and directly improve your users’ experience. A plethora of “link checker tools” exist online, but they’re either costly or don’t work well. Luckily, if you have Google Analytics on your site, you can easily find these broken links. The best part is 1) you don’t have to make any special customization to the GA code and 2) GA gives you additional info, so you can calculate lost traffic and know which links are the most crucial to fix first. In the Top Content report, use the “Filter” box at the bottom of the page to show pages containing “404.” If you don’t see any results, go to your site and type in a URL you know won’t work. Filter for your site’s Page Not Found URI. The “Previous Pages” are pages on your site containing broken internal links. Go to each of these pages on your live site and click on your links until you find the link that doesn’t work—voila! 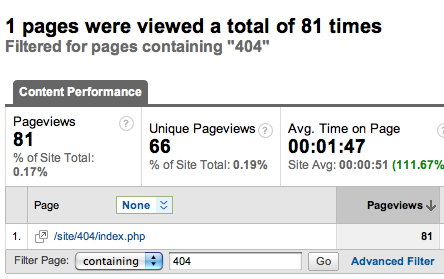 You can see that when visitors reached our example error page, 61.73% of them exited the site altogether. When we fix these broken links, we’ll be improving the experience of about 50 visits and keeping users engaged on our site longer. What if you want to find broken links to your site from sites other than your own? Wouldn’t you want to let them know to fix the link? In our example above, the 72.15% “Entrances” mean that users either mistyped a URL into their browsers, or that a link to your site from another referring site is incorrect. Let’s find potential referring sites with broken links. Click on Advanced Segments in the top right corner of the GA interface and then click “Create a new advanced segment.” Click into “Content” in the left column and drag and drop “Page” into the empty Dimension or Metric box, as shown below. Choose the condition “Contains” and make the value your 404 URI. Click “Save and Apply to Report” and then view your Referring Sites report. Here you’ll get a good idea of sites linking to yours that may contain a broken link. This won’t be 100% accurate, because it will include visitors who reached the site through a working link and then managed to click a broken link on your own site. If a site stands out, though—like our top one with 15 visits—it’s worth investigating. Hope this blog post helps you avoid those crummy link checker tools. Please comment and share any of your own insights!